One of our last posts was all about thanksgiving and joy. The premise was easy. If you are not thankful for the blessings in your life, you miss out on the joy of life as well. A world coloured by negativity and presumption is a dark world indeed. So I thought it appropriate, in learning to be thankful, to learn the art of writing a thank you note. 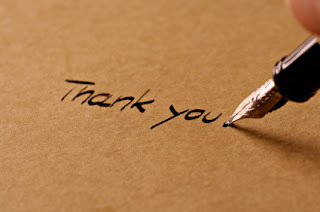 There is no reason, or excuse, for anyone to go through life without knowing how to write a proper thank you note. So, my friends, if you've never had one, consider this your introductory tutorial. Write your thank you as soon as possible after the reception of a gift. I remember sitting down shortly after my wedding to "attack" thank you cards only to postpone sending 2 cards merely because I didn't have stamps. I'm not sure why I put them where I did, but I just found those un-mailed thank you's. We've been married 7 years. Enough said. Simplicity and naturalness are paramount. This is a biggie. Again, after my wedding I recall being absolutely flummoxed on what to say on the 100+ thank you notes that had to be written. I had the "Dear Aunt Bea, Thank you for the vase" part down pat. It was what came after the initial thank you that puzzled me. 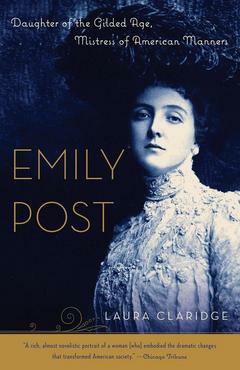 Emily Post in her book "Etiquette, The Blue Book of Social Usage" states, "Complicated form with meaningless flourishes do not make an impression of elegance and erudition upon their readers, but flaunt unmistakable evidence of pretentiousness." So instead of thanking another graciously, you begin to praise yourself and showcase your own giftedness with words and phrases. Not good. She goes on to say "for simplicity of expression such as is unattainable to the rest of us, but which we can at least strive to emulate, read first the Bible; then at random one might suggest such authors as Robert Louis Stevenson, or A.A. Milne." She's on to something here. Check out these authentic and simple expressions of kindness present in the bible. And there are plenty more where they came from. As far as the actual "thank you" part of the note is concerned, not much direction is needed. As long as you are sincerely thankful, with the help of a few examples to get you started (see below), anyone can write a cracker jack thank you card. Ask yourself what you really want to say. Except for the few cases of utterly useless and horrific gifts that everyone gets for their wedding, most of us are truly grateful, and will actually use the gifts given them. State as much in your letter - tell the gift giver how you feel about them and their generosity. I bet you will find with practice that you will no longer need the examples, but will soon be able to formulate a heartfelt thanks on your own. Be cognizant of the card's appearance. Again Ms. Post has some insight. "The letter you write, whether you realize it or not, is always a mirror which reflects your appearance, taste and character." Your handwriting should be neat and legible. Your choice of writing paper should be clean. Although on this small point, I may have to disagree with Ms. Emily. I think that sometimes it is better for a gift recipient to sit down immediately, with whatever is available (as long as it is a page free of stains, rips, etc) and write an heartfelt thank you. Sometimes it's even better to have one's children draw pictures or write thank you's, especially to family members. Of course, this wouldn't do if you're thanking a prospective employer for an interview - and you happen to write it on a napkin from McDonalds because that's all you had. One should always judge the situation. A thank you doesn't always have to be on the most pristine stationary or delicate note cards to be authentic, and sometimes waiting to go and buy said stationary or note cards means the thank you will never get written. Finally, leave your card-reciever on a kindly note. Signing your note can be tricky sometimes. In this increasingly non-personal digital age, the close of a letter isn't given much thought beyond a "see ya later". But in reality these few little words at the end of your letter can be used to communicate love and fondness. For intimate family and friends you can always sign with affectionate words such as "Devotedly" or "Affectionately yours" or "With much love and affection". "Gratefully" is good for an acquaintance (especially those who attend events like your wedding or baby shower). And "Sincerely" or "With kindest regards" works well for just about everyone else. It was more than sweet of you and Mr. Gilding to send us such a lovely clock. Thank you very, very much. Looking forward to seeing you on the tenth. I can't tell you how sweet I think it of you to send us such a lovely present, and Jim and I both hope that when we are in our own home you will see them often at our table. The mirror you sent us is going over our drawing-room mantel just as soon as we can hang it up! It is exactly what we most needed and both thank you ever so much. Please come in soon to see how becoming it will be to the room. With all you have on your heart just now, it was so sweet and thoughtful of you to go out and buy me a present, and such a beautiful one! I love it - and your thought of me in sending it - and I thank you more than I can tell you. Thank you for the very handsome candlesticks you sent us. They were a great surprise, and it was more than kind of you to think of us. Nice post. Well said. Keep it simple. I think people think they need to write an elaborate tract. There are number of ways to say thanks to our love ones. It‘s not like every time we should gift something big or expensive. What matter is how expressive we are? I was searching something over the internet and saw plascards where beautiful collections of plastic and custom cards are available at reasonable rates. So, I ordered one gift card holder and custom card for my parents as a small token just to thanks them for being there with me always.